The symptoms of thyroid nodules are discussed, including feeling a lump in the neck and a nodule under the neck skin. If symptoms are caused by a thyroid nodule, surgery is almost always required. This page of ThyroidCancer.com discusses the seven common symptoms of thyroid nodules and what to do about each type of nodule causing these symptoms. Written by Gary L. Clayman, DMD, MD, FACS. Dr. Clayman has also written extensively about Thyroid Nodules on the EndocrineWeb site here and in multiple highly reviewed medical publications. See his publications here. Last updated October 21, 2018. Most thyroid nodules do not have symptoms. Those nodules that don't have symptoms are usually found when a doctor gets some form of x-ray or ultrasound test on a patient for some other reason and that scan shows the nodule. A good example would be somebody that is getting x-rays on their neck because of neck pain, or to look at the carotid arteries. About 30% of thyroid nodules DO cause symptoms and this is the complete list of those symptoms. Below, we will examine each of these symptoms in detail and discuss what it means, and how this may affect the need for a biopsy or surgery. A lump in the front of the neck that you can feel. A lump in the neck that you can see when looking in the mirror. Usually somebody else notices it first. A sense or feeling like you need to swallow something. A cough that just won't go away. Frequent coughing during the day and a need to keep clearing your throat. Problems with swallowing. A feeling like things get stuck in your throat sometimes when eating. Symptoms of hyperthyroidism; symptoms of too much thyroid hormone (discussed below). Each of these is discussed in detail below with "what to do about it" recommendations. As you read about these differnt thyroid nodule symptoms below, we will provide links to other parts of the website that will be important to read next. Most thyroid nodules don't need a biopsy, however, thyroid nodules that have symptoms almost always will need scans and most will need a thyroid biopsy. We will help you understand this. We are also developing a Thyroid Nodule App for smart phones which will help you diagnose your thyroid nodule and tell you what you should be doing about it. Look for it in the App Store about March, 2017! Almost all thyroid nodules that cause symptoms will require surgery. The vast majority (over 80%) of thyroid nodules do not cause symptoms. But if a thyroid nodule is causing symptoms as described on this page, then an operation is typically necessary. Often a needle biopsy of the nodule will be performed prior to going to surgery. And a thyroid ultrasound will always be done. CAT scans may be required for some nodules or some symptoms. Almost everybody with symptoms from a thyroid nodule will see an endocrinologist who will coordinate these other tests and refer you to a surgeon as necessary. Always do your homework and pick the most experienced surgeon you can (and not necessarily the most experineced in your town!). Thyroid Nodule Symptoms: What do the symptoms mean to me? Let's take a close look at the specific symptoms caused by thyroid nodules, what caused these symptoms, and what to do about it. The most common symptom of a thyroid nodule is a lump in the front of your neck that you can feel. Actually, it is most commonly detected by a doctor's exam and the doctor feels the nodule. Since the nodule is a growth or lump of extra thyroid tissue that is growing inside of the thyroid gland, if that growth sticks out the front of the thyroid, you may be able to feel it. If the nodule is growing completely inside the thyroid, then usually you can't feel it (unless it gets huge). But if the nodule is only 2 cm (a little less than an inch) the patient or the doctor can feel it IF the nodule is growing outside of the thyroid on the front edge and sticking out. It should be obvious that small or medium nodules are much easier to feel in people that are thin versus those that are over weight. To be accurate, if the doctor feels it and the patient does not, then by definition the nodule does not have any symptoms. By definition, symptoms means the patient can feel or notice it. We include the doctor noticing the nodule here because the end result is the same and what to do about it is the same. Thyroid nodules that the patient can feel under the skin, which is confirmed by a doctor (or a nodule detected by a doctor during an exam) should almost always be examined by an ultrasound test. Depending on the characteristics of the nodule (it's size, how hard or soft, and how it looks on ultrasound), the nodule may need a needle biopsy. We have an entire section of this website on thyroid needle biopsies. Just like number 1 above, any thyroid nodule that is growing out the front of the thyroid may be seen if the person is thin. Most commonly, this occurs in thin women with thin necks. Often it will be a friend or family member that notices it first. This is the second most common symptom of thyroid nodules. An interesting aspect of this symptom is that other people usually notice it first, and they notice it when the patient is eating. Because the thyroid moves a little up and down in the neck in all of us when we swallow, a friend or family member is eating a meal with the person with the nodule and will notice the lump moving up and down in the front of the neck as the person swallows. Thyroid nodules that the patient can see, or somebody else can see should almost always be examined by an ultrasound test. Depending on the characteristics of the nodule (it's size, how hard or soft, and how it looks on ultrasound), the nodule may need a needle biopsy. Almost all thyroid nodules that can be seen should have a FNA thyroid needle biopsy. A thyroid nodule that causes the symptoms of the "need to swallow" something is almost always caused by a nodule that is growing on the back side of the thyoid. It can't be seen or felt under the skin like the thyroid nodules growing out the front of the thyroid (like symptoms # 1 and 2 above). It is very important to know that most commonly this is due to a large thyroid consisting of several (or lots) of thyroid nodules. Of course, a large thyroid is called a "goiter". (yup, that's what a goiter is--a large thyroid). So most people who feel like there is something stuck in their throat that they feel they need to clear by swallowing actually have a goiter made of many thyroid nodules. It is important to understand the thyroid glands with many nodules are usually treated differently than thyroid glands with one or two nodules. Like all thyroid nodules that cause symptoms, these patients need a thyroid ultrasound to look at the size, location, and characteristics of the thyroid, how many noduls are present, and where they are located. Often thyroid glands that are big (a goiter) won't have any ultrasound characteristics that are worrisome for cancer, so most of theses do not need a FNA thyroid needle biopsy. Thus big thyroids (thyroid goiters) comprised of lots of nodules often don't need a biopsy, which is in direct contrast to nodules that are single, or those that can be seen or felt (like # 1 and 2 above). However, if a thyroid is big enough that it is causing the patient to be aware of it, and it is causing symptoms of something stuck in the throat, then surgery is probably necessary. Remember, thyroid surgery isn't just for nodules that we think may be thyroid cancer, surgery is often necessary for benign, non-cancerous thyroid glands which are large and causing the patient symptoms. This situation is quite common. It is also important to know that large thyroid goiters, and nodules that are on the back side of the thyroid are often required to have a CAT scan, since these bigger thyroid glands are not seen as well with ultrasound. This is why you need a good endocrinologist who know which scan to order and which scans are not necessary. Remember, a large thyroid is called a goiter and we have an entire page on thyroid goiters. Another symptom of thyroid nodules is a chronic cough, a cough that just won't seem to go away. Like the nodules that cause swallowing symptoms, thyroid nodules that cause the patient to cough are almost always on the back side of the thyroid. The caugh is caused by the nodule irritating the trachea, or the vocal cord nerve. We have two vocal cord nerves (one on each side of the neck, behind the thyroid) and a nodule growing back there can rub or stretch the nerve causing irritation and the need to cough. Thyroid nodules that cause the patient to cough should always be evaluated with an ultrasound scan. Occasionally a CAT scan is required because it is better at looking at big thyroid goiters than ultrasound is (and to look deep where the nerves are located). Sometimes it just can't be known for sure if the thyroid nodule is actually causing the coughing. Often these patients undergo a laryngoscopy (where a scope is placed into the back of the throat to examine the vocal cords). If the thyroid nodule is causing the coughing, or there is a high liklihood it is the cause, then surgery is indicated. Of course, it is now very important for you to chose your surgeon wisely. The nerves to the vocal cords (the recurrent laryngeal nerves) are occasionally damaged by a surgeon removing a thyroid (or parathyroid) and this will cause severe horseness and a loss of voice for months or even forever. We have an entire page dedicated to helping you chose a surgeon wisely! CT scan of the neck showing a very large goiter (all the ugly stuff!) that fills the neck and is blocking the trachea. Occasionally a thyroid nodule will be in such a location that it is compressing the trachea, but this is almost always due to a thyroid goiter that is comprised of lots (dozens) of thyroid nodules. This can cause the symptom of feeling like you can't catch your breath sometimes. Often this symptom shows up when the person is laying down flat in bed on their back. They feel that there is pressure of some kind that makes it difficult to take deep breaths. Sometimes this is interpreted as "Sleep Apnea" when really it is a large thyroid goiter which is pushing on the trachea making the opening in the trachea smaller. It's like breathing through a straw, and the straw gets smaller when you lay down and the goiter pushes on the trachea more. The picture on the right shows a large goiter made up of dozens of nodules (remember, "goiter" just means big thyroid"). It took about 20 years for this goiter to grow this big, so it is growing very slowly. Thus the patient's symptoms develop very slowly over many years and they often don't do anything about it, ignoring the symptoms until it gets pretty bad. The trachea is the black spot in the middle of the picture and you can see how it is getting compressed by the goiter. This huge goiter was removed by Dr Clayman with a routine neck incision during an opertion that took just over 1 hour. The patient went home the next day feeling better than she has felt in years. (obviously that is not a surprise!). A thyroid nodule (or typically a large thyroid goiter) that causes problems with breathing should almost always be removed with surgery. This is a routine operation because this symptom is pretty common. There is an uncommon thyroid cancer that can present with these pressure on the trachea symptoms, but the vast majority of people with this symptom have a large, benign (non cancerous) goiter that needs removed. An ultrasound scan (and then a CAT scan) should be done in all patients who have problems breathing related to the thyroid gland. The symptom that something gets stuck in the throat when eating is due to something going on with the esophagus (not discussed here), or a thyroid nodule that is pressing on the esophagus. The thyroid normally is attached to the front of the trachea and along both sides. But normally the thyroid doesn't go all the way around to the back side of the trachea to where the esophagus is located. If a thyroid nodule grows on the back side of the thyroid and wraps around the trachea to push on the esophagus, you will feel this when you swallow. Typically it is solid foods like bread and meat. Liquids go just fine and don't get stuck going around the kink in the esophagus like a firm chunk of food does. 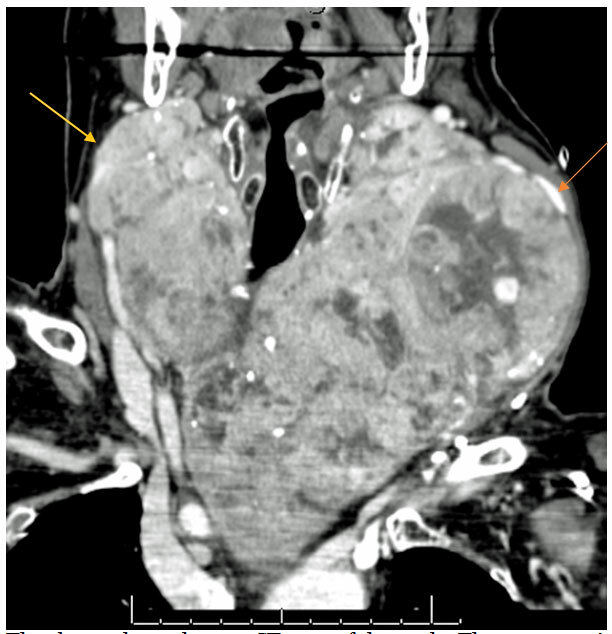 The photo above shows a large thyroid goiter that is pressing on the trachea. Goiters just like this can go around the trachea and push on the esophagus. A CT scan would look similar to the one above. A thyroid nodule that causes any symptom of swallowing will need to be removed with surgery. The vast majority of these are simply large, benign goiters and only very few are cancerous. But like almost all thyroid nodules that cause symptoms, surgery will be necessary for this group. Many of these goiters won't need a biopsy because it can be hard to get all the way to the back of the neck with a needle. Almost all of these will need a CAT scan to give the surgeon a better understanding of how big the goiter is and where it goes. What to do about it? - The only way to tell if a thyroid nodule is causing the symptoms of hyperthyroidism is to get a thyroid ultrasound to see the location of the thyroid nodule and it's size, and then to get a radioactive thyroid scan (typically a radioacive iodine scan) to see if this nodule is "hot" and thereby producing too much thyroid hormone. If it is determined that the hyperthyroidism is caused by a hot nodule, then discuss with your surgeon the removal of the nodule only. That is the operation we would do, and what we would want done on ourselves! The goal should always be to leave as much normal thyroid behind. Trust us, you want to keep your normal thyroid.